Justice, Ted and Libby’s (from left) guardian called me in to help stop her dogs from barking and getting over excited when guests knock or come in the front door. When Im working with a client who has multiple dogs that have behavior issues, I always start out by asking what kind of rules and structure the dogs are expected to follow. As it turns out, their guardian had introduced a few rules, but there were some easy ones that she wasn’t using. Enforcement of these rules gives the guardian an opportunity to take the leadership role each time they correct the dogs. Rules and structure are am important part of the rehabilitation process when you have dogs that charge the door or get excited when anyone knocks. 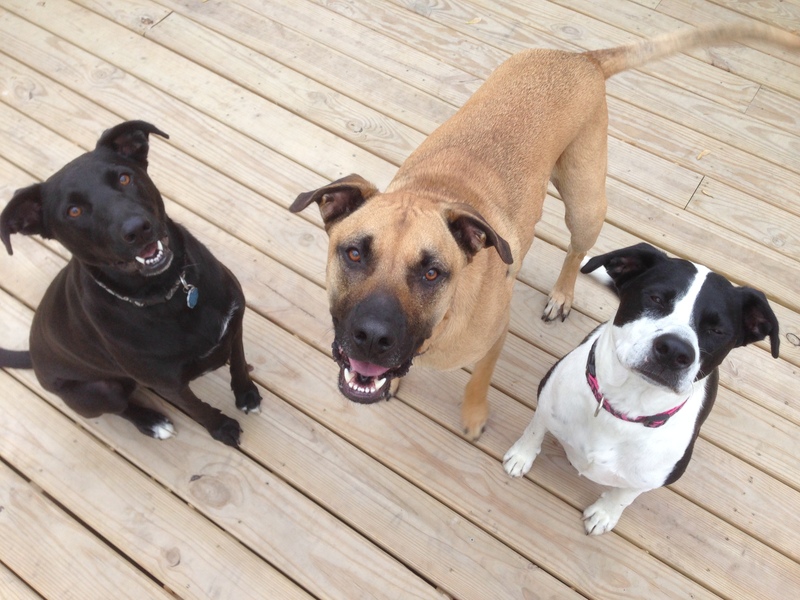 Security is a leadership job for dogs who live in a group. I have found the best way to stop the behavior is to make sure the dogs understand that the humans are in the leadership position. To help change the leader follower dynamic, I went over a few exercises to help the dogs start to see themselves in the follower position. After demonstrating the exercise a few times, I coached their guardian through it so that she can practice it with all three dogs for a week or two after the session to really seal the deal. To address the door issue, I had a neighbor come over and play the part of an arriving guest. I had them knock like crazy so we could deal with a worst case scenario. 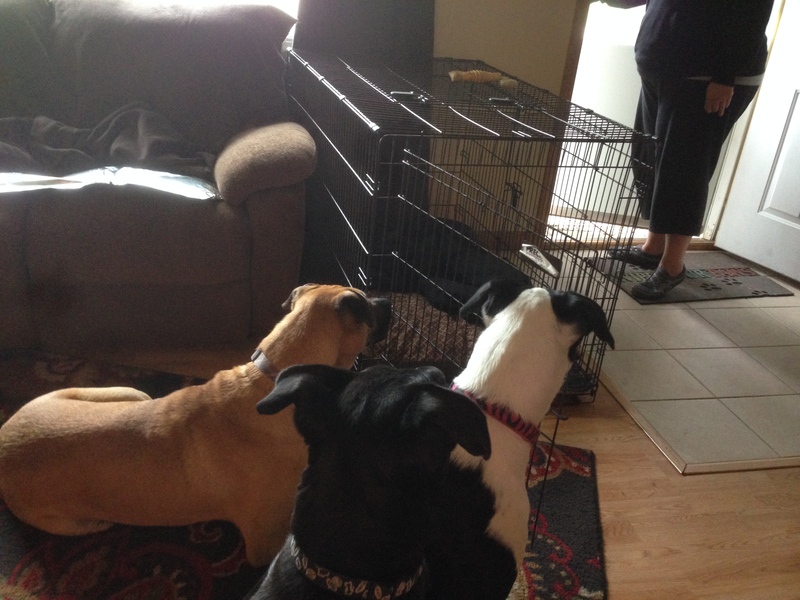 As soon as the dogs heard the knock, they started to bark and rushed the door. I got up and calmly walked over to the door and once I was past the dogs, I turned so that i was facing them and the door was behind me. Because Ted was the most excited, I focused on him first. I took a sudden and deliberate step right at him which caught him by surprise. This stopped his barking for a second as he tried to determine what I was doing. But the pause in barking was short lived. At the sound of the next knock, Ted started barking again and took a step towards the door. I made a sound to disagree with him and then started marching right at him to back him away from the door. Once I got him about 10 feet back I stopped and paused for a moment. The second Ted started towards the door again I took another sudden step at him. This stopped his barking and prompted him to sit down. I waited for a second to make sure he was going to stay in place before I turned my attention to the other dogs. I walked Justice and Libby away from the door much easier that Ted. All the while, the neighbor was knocking on the door like crazy. Only after I got all three dogs behind the 10 foot line did I open the door. As soon as I did, Ted and Justice got up and started to move forward again. I made the sound to disagree with them and took a sudden step in their direction. This stopped the barking again and caused Justice to sit down again. After going over the exercise with their guardian, we repeated it again but this time the guardian was the one who answered the door. It took her a little longer to get them back the first time but she was eventually successful in getting them behind the line. It will take practice at the door along with the the leadership exercise I went over earlier before the dogs learn to adopt a new way of reacting to a knock at the door. Consistent enforcement of the new rules will assist her once the dogs start to realize that their guardian has security under control. Once that is the case, they will be able to go back to being dogs again and leave the leadership responsibilities to their guardian. By the end of the session all three dogs were wiped out. But I was most pleased with their reaction to her commands, corrections and the way they were looking at her. With respect. They weren’t leaning against her anymore or ignoring her. Instead they were showing respect for her personal space, watching her for cues and commands and had even started to restrain themselves when it came to observance of the new rules. It won’t happen overnight, but based on the progress we made in the session, it shouldn’t take long for the dogs to understand its no longer their job to handle the door or visitors.